Sunlight streaming into the home is a sign of a well-designed home. Everybody loves a room bathed in natural light but there are also times when the sunlight coming into the home is simply too bright. Excessive brightness can get uncomfortable when you are trying to read a book or watch television. Conventional solutions such as curtains and blinds may keep the light out but will still let the heat in, making the interior space uncomfortable in summer. The amount of sunlight we prefer coming into our homes changes from season to season. During the bright summer days, we would ideally like to keep the sun out as much as possible to enjoy a cool indoor climate. On cold winter days, we yearn for the warm comfort of the sun. What you need is a louvered canopy that can stop UV rays from entering and heating up your home, and allows you to control the amount of sunlight coming into your home according to the season and your personal preferences. 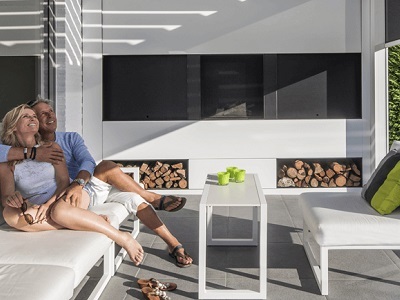 Renson offers patio covers with a sun-controlling feature that allows you to enjoy the outdoors all year round and keeps your interiors cool or warm according to the season. With Renson’s patio cover shading your patio, you can have lunch outdoors or entertain your friends, and enjoy the fresh garden air – come rain or shine. Thanks to Renson’s sun-controlling patio covers, you can now manage the amount of sunlight coming into your home all year round.